All Lost Dutchman races except the full marathon start and end in Prospector Park. Marathoners must park at the Rodeo Grounds. Driving directions and parking instructions are provided below. If you are a spectator or are doing the Half Marathon, 10K, 8K, or 2 mile skip to Parking For All Events. All runners will be bused to the start. No private vehicle drop off of runners at the start line will be allowed. The marathon finishes at Prospector Park, there are regular shuttles back to the Rodeo Grounds. Park your vehicle at the Rodeo Grounds. Buses will begin loading at The Rodeo Grounds at 4:30 a.m. The last bus to the start will leave the Rodeo Grounds at 5:45 a.m. sharp. Clothing will be transported back to the finish line and made available immediately after the race. If you have someone with you, they may drop you off at Peralta Trail Elementary School. This is drop off only, and unattended cars may be towed. Buses leaving Peralta Trail Elementary School will begin loading at 5:20 a.m. and the last bus will leave at 6:05 a.m. sharp. There is no transportation provided back to the school after the race. The last bus will remain at the start line to transport clothing back to the finish line and be available on the basketball courts in the park. Spectator friendly locations for all events are marked on the marathon course map below. Marathoners must park at the Rodeo Grounds. All other entrants and spectators can park at the Rodeo Grounds and take a short shuttle to the park or park in or as near as possible to Prospector Park. Parking at Prospector Park is very limited, overflow is north on Idaho and on McKellips. 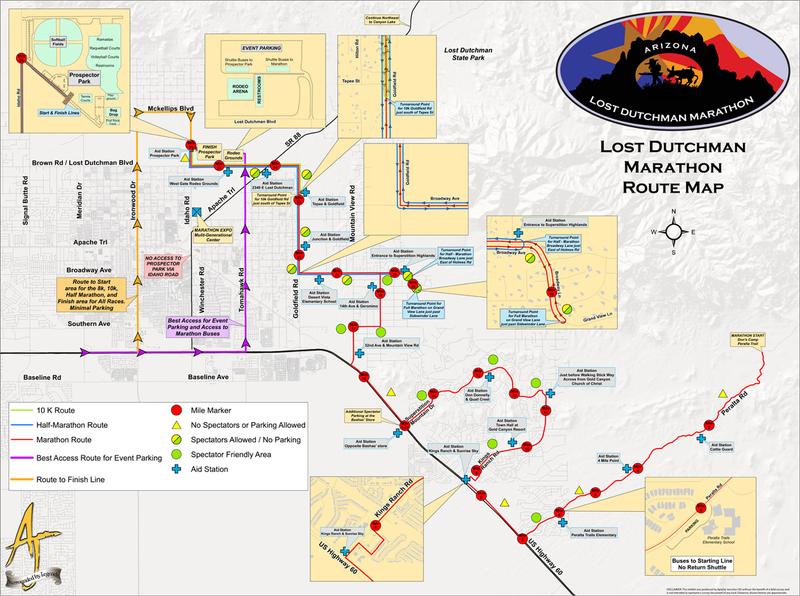 From Phoenix Metropolitan Area: Reach the Lost Dutchman Marathon by Traveling east on U.S. 60 (Superstition Freeway) from Phoenix. To access the Rodeo Grounds take the Tomahawk Road Exit and head north approximately 2 miles and turn left into the rodeo grounds entrance. For Prospector Park and Idaho Road access, exit at Ironwood. Turn left and proceed north on Ironwood approximately 4.5 miles, then turn right on to McKellips Road. Proceed one mile and turn right onto Idaho Road. From Mesa/Scottsdale: Use U.S. 60 as described above or if traveling south east on SR 202 (Red Mountain Freeway), exit on University, turn left. Proceed east to Ironwood, north to McKellips, east to Idaho and south to the park. The Rodeo Grounds are located at 1590 East Lost Dutchman Road and is the recommended parking for everyone. Prospector Park is located at 3015 N. Idaho Road, Apache Junction, AZ 85219. Limited early parking for non-marathoners is available within the park and along Idaho Road to the north. Half Marathon / 10K / 8K / 2 Mile Run or Walk: Your races begin and end at Prospector Park in Apache Junction. You may use the Tomahawk access and take the shuttle as described above or driving east from Phoenix on US 60, exit at Ironwood. Turn left and proceed north on Ironwood approximately 4.5 miles, then turn right onto McKellips Road. Proceed one mile and turn right on to Idaho. Proceed approximately ½ mile to parking lot. If the parking lots are full you may park anywhere along Idaho north of the south access to the park. Do not attempt to access the park on Idaho as it will be closed at 7 a.m. for preparation of the race course. Spectators: The best access to see the start and finish of the Half Marathon, 10K, 8K, and 2 mile is Prospector Park. This is also the finish line for the Full Marathon. You may use the Tomahawk access and take the shuttle as described above or driving east from Phoenix on US 60, exit at Ironwood. Turn left and proceed north on Ironwood approximately 4.5 miles, then turn right onto McKellips Road. Proceed one mile and turn right on to Idaho. Proceed approximately ½ mile to parking lot. If the parking lots are full you may park anywhere along Idaho north of the south access to the park. Do not attempt to access the park on Idaho as it will be closed at 7 a.m. for preparation of the race course. Shuttle Bus Schedule between the Rodeo Grounds and Prospector Park on Race Day. All runners and spectators can park at the Rodeo Grounds confident that they will be able to easily get to their race and back to their vehicles. First shuttle bus departs Rodeo Grounds to Prospector Park at 5:00 a.m. Subsequent shuttle bus runs between Rodeo Grounds and Prospector Park run continuously all day. Last shuttle bus departs Prospector Park to Rodeo Grounds at 2:00 p.m. Parking for all races is available at the Rodeo Grounds. Access to the Rodeo Grounds will be via Tomahawk Drive only. For runners and spectators shuttle buses will be available throughout the day between parking at the Rodeo Grounds and the start finish line in Prospector Park. If you wish to exercise, the walk is approximately 0.9 miles. See the map of Prospector Park and Parking at the bottom of this page. Spectators and runners with races originating at Prospector Park can park on the north side of the park following the Ironwood Exit route. indicated by the orange arrows on the map to the right. 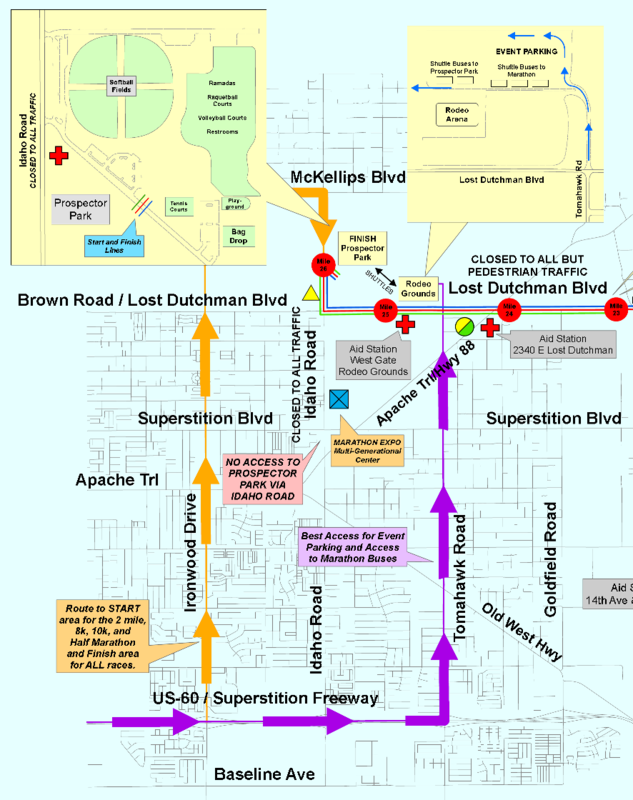 Lost Dutchman Boulevard will be closed at 6:00 a.m. through the duration of our event.